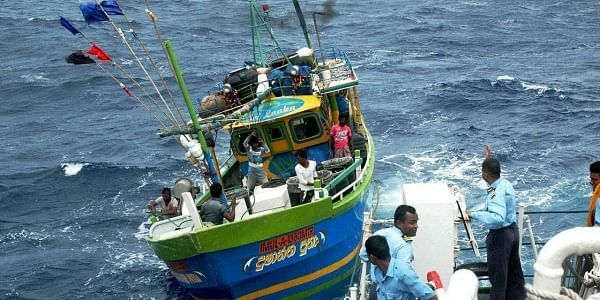 Fourteen Tamil Nadu fishermen were arrested by the Sri Lankan Navy when they were allegedly fishing near Neduntheevu in the island nation waters today. RAMESWARAM: Fourteen Tamil Nadu fishermen were arrested by the Sri Lankan Navy when they were allegedly fishing near Neduntheevu in the island nation waters today. The fishermen from here and Pudukottai district were arrested on charges of poaching fish with banned fishing nets in the exclusive zone of Sri Lanka, Assistant Directors of fisheries department, Manikandan said. The naval personnel also seized three mechanised boats and took them to Kangesanthurai port there, he said. Tamil Nadu Chief Minister K Palaniswami had on October 27 urged the Centre to take steps to secure the release of 54 fishermen and 140 fishing boats from Sri Lanka.